Modern technology has made the loss of treasured items an unlikely event. From missing pets to vehicles and even people, the global interconnectivity brought about by rapid advances in 21st century technology has revolutionized how we locate and retrieve lost treasures. Despite this incredible technology, the challenges of old remain. While a lost cellular phone or car keys can be quickly located with modern devices, the real difficulties come with attempting to locate something that was not intended to be found. Murder weapons, critical evidence, and ancient wrecks are just a few examples where modern technology will not immediately solve the problem, and the only option is to search. Critical to this process is prior intelligence, search planning, safety considerations, and finally equipment. When it comes to locating submerged items, JW Fishers has the tools for the job that not only lead to efficient and timely mission accomplishment, but increase safety by reducing the exposure of operators in the field. From missing handguns tossed into a lake or stream to searching a 19th century wreck for priceless treasure, the tool widely used by law enforcement, public safety dive teams, treasure hunters, commercial divers, and hobbyists is the JW Fishers Pulse 8X underwater metal detector. The Pulse 8X is JW Fishers’ leading underwater metal detector and has been a staple tool for professional divers for the past 32 years. In 2014, it was named the #1 underwater metal detector by an independent study performed by the U.S. Department of Homeland Security. The P8X was compared to seven other leading detectors on the market and found to be the most economical, effective, and reliable tool for the job. The P8X comes with everything you need to search both on land and submerged to a depth of 200’. The unit comes equipped with a land handle and telescopic extension, an underwater handle, two chargers (AC/DC), a land headset, an underwater “bone” phone, and a diver’s belt to hip-mount the unit if desired. Robert Love, an avid diver for many years, uses his Pulse 8X on all of his dives, mainly focusing on the Piscataqua River in New England. Rob states that his finds “have ranged from locks, old tools and winch heads to a WW1 era Hales bomb, minus the detonator and explosives. The bomb was about 2’ under the mud!” This was the second bomb that Rob has found, his first being a civil war Parrot artillery round, which was still full of powder. He also found a bag full of ammunition in about 1’ mud. Police and Dive Teams also utilize the Pulse 8X for their day-to-day jobs. The King County Marine Rescue Dive Unit (MRDU) in Kirkland WA purchased a detector earlier this year. The MRDU deploys specially trained and equipped divers that are responsible for water-related law enforcement, investigations, rescue, and recovery work. Duties include victim recovery and investigation, evidence search and recovery, and safety inspections. The Puget Sound, Lake Washington, Lake Sammamish and the surrounding King County areas are all part of the covered terrain. Deputies are trained and equipped in swift water, flood, and ice rescue and recovery operations. This is all done while utilizing special equipment to get the job done safely and efficiently, and JW Fishers is immensely proud to be part of their team. These highly trained individuals can even be lowered by helicopter into remote areas. 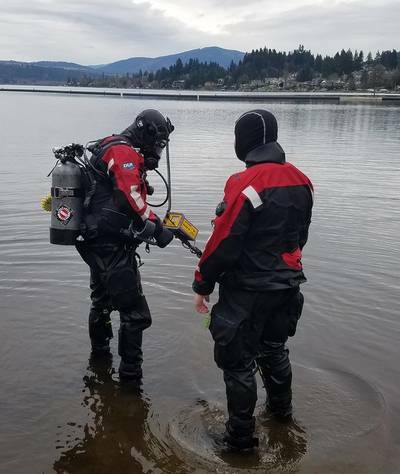 A training event held in March of 2018 proved to be quite challenging with the water “being a cool 43 degrees.” Their Pulse 8X underwater metal detector was the focus of the exercise which took place at Vasa Park in the City of Bellevue on Lake Sammamish. Divers took turns getting familiar with the equipment and understanding how the detector operates. It came as no surprise that the P8X worked as expected and continues to serve as a force multiplier for this highly impressive team. A few of the many other military and law enforcement dive teams using the Pulse 8X are the U.S. Customs and Border Patrol, Connecticut State Police, Swedish Coast Guard, Royal Canadian Mounted Police, US Naval Surface Warfare Center, Texas Highway Patrol, New Jersey State Police, Policia de Puerto Rico, Ottawa Police Service in Canada, Oklahoma Highway Patrol, Olmstead Sheriffs Dive Team in Minnesota, Maine State Police, and the U.S. Navy Expeditionary Combat Command and their Facilities Engineering Service Center in California.